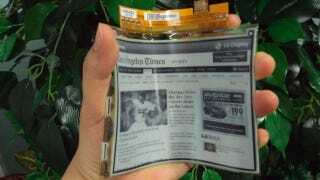 The future of digital reading is flexible. And by flexible, I mean bendable, not multipurpose. Now, LG has announced the first malleable, plastic e-ink display, and while it's hardly Retina, it will be appearing in devices as early as this summer. What Would It Take For Apple to Make a New iPad Truly Exciting Again? The six-inch display is made of plastic, which allows it to bend at an angle of up to 40 degrees. It's also thinner—at just 0.7 millimeters—and lighter than its glass counterparts, weighing in at 14 grams.